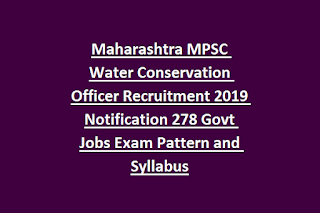 Maharashtra MPSC Water Conservation Officer Jobs Prelims Exam Syllabus: Maharashtra PSC is released a new notification to conducted t he MPSC Engineering Services Exam 2019 for filling the available Water Conservation Officer WCO jobs in Soil and Water Conservation Dept. 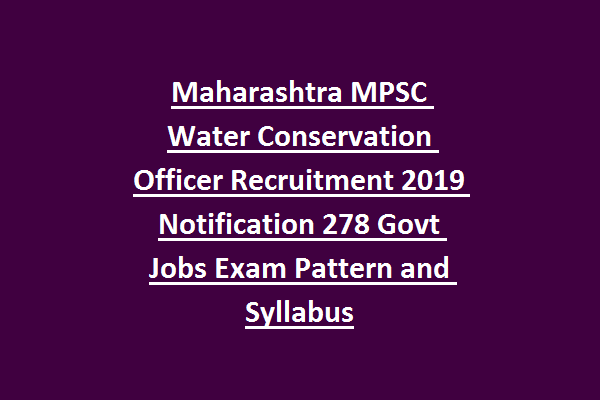 There are total 278 posts in this MPSC Water Conservation Officer Recruitment 2019. In this notification we are also providing the exam pattern, exam syllabus pdf link for the MPSC Water Conservation Officer Vacancies. Apply online for this MPSC WCO Recruitment 2019 before the closing date of 23-04-2019 via the official website of https://mahampsc.mahaonline.gov.in. Maharashtra PSC WCO Vacancies Age limits, WCO selection process, prelims exam syllabus pdf and other details of Maharashtra PSC Engineering Services WCO Prelims Exam is updated below. There are total 278 posts in this Maha PSC WCO Recruitment 2019. As on 01-08-2019 for general candidates age limits are 18-38 years and for others 18-43 Years. B.E in Civil Engineering or Rural Engineering qualified candidates are eligible to apply online for this MPSC WCO Posts. Candidates selection for Mahapsc Soil and Water Conservation department vacancies will be through Prelims Exam (100 Marks), Mains Exam (400 Marks) and Interview (50 Marks). Maha PSC Engineering Services Prelims Exam will be conducted for 100 Marks. MPSC Water Conservation Officer Posts written exam will be consists of 100 questions. Each question carries 1 mark. Download Exam syllabus here for MPSC WCO Prelims Exam 2019. Apply online for this Maharashtra MPSC Water Conservation Officer Recruitment 2019 notification through official website of https://mahampsc.mahaonline.gov.in. Last date to apply online for this MPSC WCO Recruitment 2019 is 23-04-2019. WCO Exam Syllabus pdf, WCO prelims Exam Date, WCO prelims Hall Ticket/admit card and other details will be updated in this website only.